I grew up loving Big Chief tablets. I still buy them wherever I can find them with the old ones becoming scarce and even expensive. Relics of the past. The new ones, if you can find them, retain some of the old characteristics; the paper is similar in texture, but sadly, the covers are brighter and the image of the Chief has been updated. My best find was an old dime store going out of business, where I bought all they had – a stack with their original yellowed price tags on the back so the covers looked pristine. 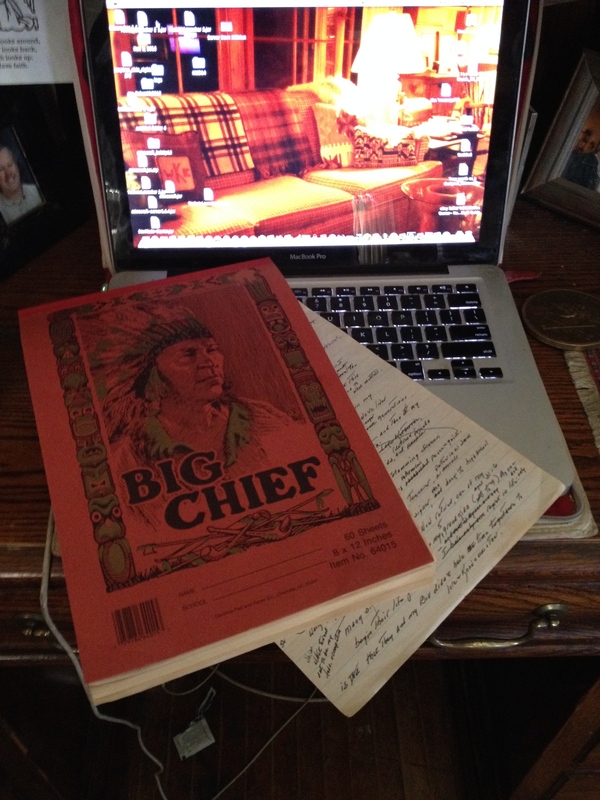 Now that I’m blogging, I’m grateful to have the old Chiefs. The smooth newsprint pages with lines just right contain a myriad of ideas, incomplete sentences with words crossed out and replaced, memories. hopes and dreams – plus all the oddities that fill my head in a day. Growing up in the ’50s with parents who loved me, being close to two sisters, a man I adored who gave me two sons and a daughter, 5 happy grandkids and a daughterinlaw I love, friendships I cherish, Labradors under my feet, a knotty pine cabin upnorth on a beautiful lake, fine next door neighbors here and up there, pretty ribbons, books and more books to read, coffee, wine and chocolate and now – happily growing older.